The production of bicycles in Britain and the United States recently suffered severe setbacks. The renowned American Schwinn brand was downgraded to the mass market by its new owners following bankruptcy, and Britain's Raleigh came close to closure because of high debts and poor returns, saved only by a last-minute management buyout. In both cases, market share and credibility were lost to newer, more innovative firms, as well as to a recentering of the global bicycle industry in the Far East.This book reflects on such changes by setting them within a sociological and historical context. 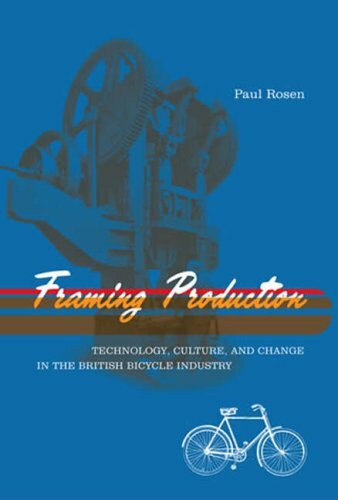 It focuses on the British bicycle industry in the interwar years and in the 1980s and the 1990s--periods characterized by modernization of production and of industrial organization, by changing relations among players in the industry, by new developments in labor relations, and by changes in interactions between markets and product design. In particular, it traces the fortunes of the Raleigh Cycle Company from its beginnings as an innovative young firm, through massive expansion of its products and markets and the assimilation of many of its competitors, into further innovation amid market contraction and management inertia, and finally into a phase of global restructuring that has transformed and reduced its role within the industry.The book explores the complex ways in which product design, production methods, industrial organization, and the cultures of cycling have interacted to create a succession of sociotechnical frames for the bicycle. At the same time, on an activist level, the book promotes a participatory politics of bicycle technology and a less car-centered view of personal transportation. This is a study of technological, sociological, and cultural changes in the British bicycle industry from the 1870s to the present.In recent years, the production of bicycles in Britain and the United States has suffered severe setbacks. Market share and credibility have been lost to newer, more innovative firms that are in large part located in the Far East. "Framing Production" reflects on such changes by setting them within a sociological and historical context. It focuses on the British bicycle industry in the interwar years and in the 1980s and the 1990s - periods characterized by modernization of production and of industrial organization, by changing relations among players in the industry, by new developments in labor relations, and by changes in interactions between markets and product design. In particular, it traces the fortunes of the Raleigh Cycle Company from its beginnings as a young and innovative firm, through massive expansion of its products and markets and the assimilation of many of its competitors, into further innovation amid market contraction and management inertia, and finally into a phase of global restructuring that transformed and reduced its role within the industry.The book explores the complex ways in which product design, production methods, industrial organization, and the cultures of cycling have interacted to create a succession of sociotechnical frames for the bicycle. At the same time, on an activist level, the book promotes a participatory politics of bicycle technology and a less car-centered view of personal transportation.